Bike looks stunning in every way and all your hard work paid off VERY well man! Quick question - What is your relevance with "Aruba.iT" which is on each side? Are they a sponsor for you or is it something you personally own? Again, congrats and can't wait to see some pics of you on all these serious race tracks you stated! Please post some up on this thread when you get some on this bike ok? Copy from post #7 "Fairings are from MOTOXPRICAMBI and I highly recommend." Gunny- Those fairings would be the 15' WSBK Ducati team replica design used by Chaz and Davide. Looks great and thanks for the thread! Only question I have is with the tank cover and how does that fit around the gas cap without leaving space for fuel to spill and get between? thats a great looking fairing kit. Also interested where you got those from. Did you get it painted it like that or it came already pre-painted? 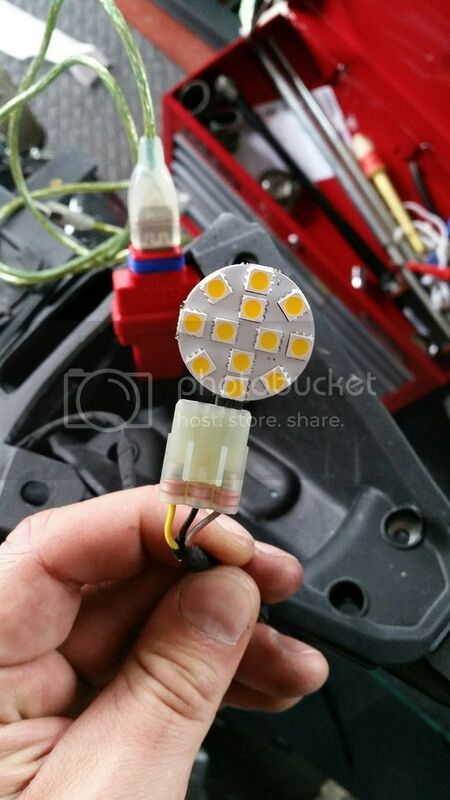 Whats up with that LED Headlight? Thanks...! The tank cover was a bit tight going on, its made of fibreglass so not much flex in it. I covered the tank with gaffer tape of all things to protect the paintwork, pushed it down as far as I could but still had a little gap in between...Probably could make it more flush but I wanted to make sure there was plenty of protection underneath. I'll just go careful with the fuel! To clear the 'STOP LIGHT' warning on the dash I read on here about the resistor option but I just used a small 12v LED light which slotted in the block perfectly, taped it up and tucked it away in the tail. Only problem i'm having with the MOTOXPRICAMBI fairings is with the tail unit. It sits on the seat bracket at the front and fastens with the 4 screws underneath but it puts a lot of load on a small contact patch which has split the fibreglass slightly. I have re-inforced it with steel washers but I was wondering what others have used on their track fairings? what kind of stand is it ?